Choice overload is a common experience during the process of researching for and purchasing mattresses. With thousands of mattresses available on the market, the consumer is spoiled for choice. In many aspects of life, having an abundance of options is a plus. But when it comes to buying a mattress, it can be an overwhelming task to narrow down a seemingly infinite pool of items to one that suits your needs. Finding ways to trim down the list can be a great turning point in your decision-making process. It’s an intuitive but also evidence-based idea that the level of firmness a mattress gives is a key factor in long-term customer satisfaction. The level of firmness a mattress provides has a direct impact on the amount of comfort a sleeper experiences. The range of firmness level available in the market goes from very firm to very soft. There are many things to consider in choosing a firmness level. For example, weight is a factor; light weight sleepers should opt for a soft mattress, while average weight sleepers should go with a soft or medium firmness mattress and heavier sleepers should choose a mattress that is firm. One tricky aspect is that the different brands all use different terms to categorize their mattresses. The categories typically consist of a numbered ranking system. The system can be one to ten, one to six, one to four, etc. However, for decision-making purposes, it is best to keep things simple by using a firmness scale of firm to medium to soft. 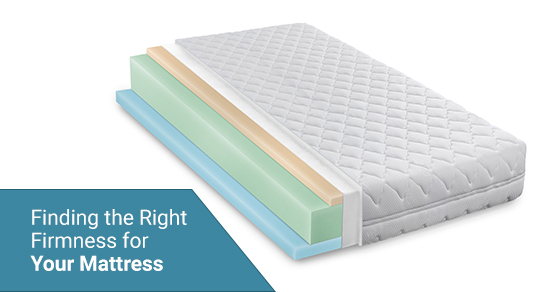 Keep in mind that the support level of a mattress is district from its firmness level because the support structures are located in the mid layers of the mattress whereas the firmness structures are located in the upper layers. So how can you determine which firmness level works for you? Important factors include spinal alignment, preference for sleep position and testing the mattress in person for comfortability. A mattress that provides proper alignment of the spine is very important for getting a good night’s sleep. During our conscious hours, we naturally maintain a healthy range of alignment in the spine by using our muscles to support it and by adjusting intermittently to avoid strain. But when we’re unconscious and our muscles relax, the body relies on the mattress to maintain alignment. So if you’re sleeping on a mattress with the wrong firmness level, you will wake up feeling sore. The curve of the spine must be supported by your mattress, which provides relief to pressure points. Along with the spine, it is important to reduce pressure in areas like the legs, hips and shoulders. Your sleeping position of choice is a major part of determining the best firmness level for you. Depending on which body part is carrying your weight in a given position, such as the hips receiving pressure in the stomach sleep position, that body part carrying the weight is under pressure for hours at a time. Our tips for firmness level in relation to sleep position are designed to address the need to relieve pressure in specific places. The stomach sleep position is best suited to a firm mattress. The hips take most of your weight in the stomach sleep position and a firm mattress will stop the hips from sinking lower than the shoulders. The side sleep position requires a soft mattress. A soft surface allows the mattress to conform to pressure points in the shoulders and hips, as well as the arm that gets tucked beneath side sleepers, preventing numbness and tingling. The back sleep position is very versatile and is compatible with any level of firmness. Many back sleepers find a medium firmness to be suitable, but soft or firm options are also reported to be comfortable. This is because in the back sleep position the pressure of carrying weight is quite evenly spread across the whole body. If you have a sleep partner who uses a sleeping position different from yours, a medium firmness mattress can be a good compromise to satisfy both partners. If you sleep with a dog, cat or other pet, consider buying a mattress one size larger than otherwise needed, such as going from a queen to a king size. Nothing can replace testing a mattress out in real life. Whether this occurs during an online retailer’s sleep trial period, or during a visit to a brick-and-mortar shop, when you know, you know. Outlined below are some tips that will help you articulate the sensations and reactions that a mattress evokes in you. A mattress is too firm for you if you feel as though you are sleeping on top of or away from the mattress. Another sign is that joints such as the knees, shoulders, or hips are elevated above the rest of your body. Tingling or numbness in the shoulders and hips is a troubling sign of a mattress being too firm. A mattress is too soft for you if you find getting in and out of the bed awkward or uncomfortable. Other signs include a feeling of hitting the bottom of the mattress just a few inches in, and your joints sinking below the rest of your body. Once you have determined a firmness level that fits your needs, the overall mattress selection process will go along smoothly. Use your instincts when it comes to other factors such as the material from which the mattress is manufactured and the heat retention level. MattressVille offers a 60 Day Comfort Exchange Guarantee that gives you peace of mind, knowing you can test that the firmness level still works for you after the breaking-in period.